The Boring Company, owned by Elon Musk, demonstrates a section of its high-speed transportation tunnel in Hawthorne, California. Cars in the tunnel can supposedly travel at speeds up to 241 kmph safely. Some two years ago, Elon Musk decided to found a new company because traffic in Los Angeles was driving him “nuts” (that definitely sounds like him, doesn’t it?). More specifically, he founded The Boring Company to build a tunnel for high-speed transportation. Today, feeling that his vision had finally taken shape, Musk unveiled the 1.8-kilometre-long tunnel in Hawthorne, California as a proof of concept. 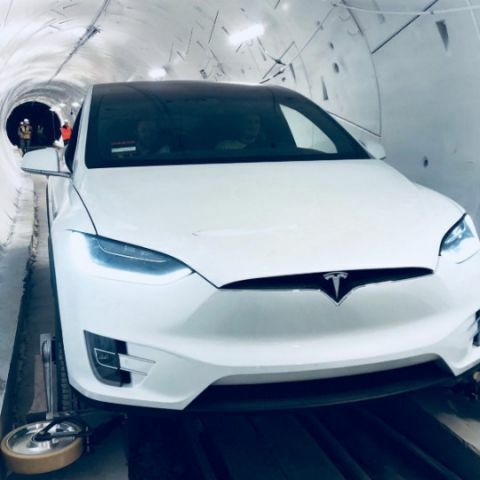 During the presentation, The Boring Company was seen sending a modified Tesla Model X SUV through the tunnel at speeds between 64 and 80 kilometres per hour. Musk remarked later on Twitter that cars in the tunnel will later be able to travel at speeds up to 241 kilometres per hour safely. According to Musk, the tunnel cost the company about ten million dollars to build. In the image tweeted by Musk, we see a Model X fitted with an alignment device in the front. The device consists of a deployable wheel gear on either side of the car’s front bumper and is what keeps the car from veering off course while passing through the tunnel. According to Musk, the retractable wheel gear “can be applied to any autonomous, electric vehicle, not just Tesla”. “If driver passes out or goes crazy those tracking wheels ensure the car stays on track,” he added in a statement. According to a report by CNBC, Musk described the company’s high-speed transportation tunnels as “an actual solution to the soul-crushing burden of traffic” during the Tuesday evening presentation. Currently, the demonstration tunnel starts from the car park of the SpaceX headquarters and runs under 120th Street for up to 3.2 kilometres. Musk commented that he later plans to unveil elevators that bring users’ cars from ground level to the tunnel.